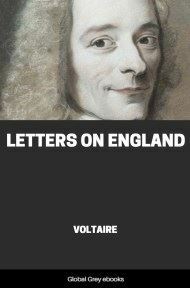 Letters on the English (or Letters Concerning the English Nation) is a series of 24 essays written by Voltaire based on his experiences living in England between 1726 and 1729. 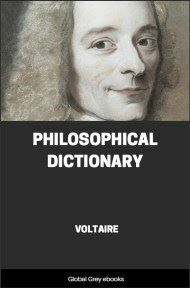 I was of opinion that the doctrine and history of so extraordinary a people were worthy the attention of the curious. To acquaint myself with them I made a visit to one of the most eminent Quakers in England, who, after having traded thirty years, had the wisdom to prescribe limits to his fortune and to his desires, and was settled in a little solitude not far from London. 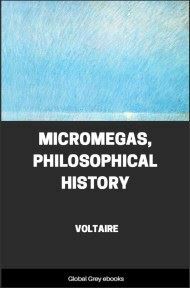 Being come into it, I perceived a small but regularly built house, vastly neat, but without the least pomp of furniture. The Quaker who owned it was a hale, ruddy complexioned old man, who had never been afflicted with sickness because he had always been insensible to passions, and a perfect stranger to intemperance. I never in my life saw a more noble or a more engaging aspect than his. He was dressed like those of his persuasion, in a plain coat without pleats in the sides, or buttons on the pockets and sleeves; and had on a beaver, the brims of which were horizontal like those of our clergy. He did not uncover himself when I appeared, and advanced towards me without once stooping his body; but there appeared more politeness in the open, humane air of his countenance, than in the custom of drawing one leg behind the other, and taking that from the head which is made to cover it. "Friend," says he to me, "I perceive thou art a stranger, but if I can do any thing for thee, only tell me." "Sir," said I to him, bending forwards and advancing, as is usual with us, one leg towards him, "I flatter myself that my just curiosity will not give you the least offense, and that you'll do me the honour to inform me of the particulars of your religion." "The people of thy country," replied the Quaker, "are too full of their bows and compliments, but I never yet met with one of them who had so much curiosity as thy self. Come in, and let us first dine together." I still continued to make some very unreasonable ceremonies, it not being easy to disengage one's self at once from habits we have been long used to; and after taking part in a frugal meal, which began and ended with a prayer to God, I began to question my courteous host. I opened with that which good Catholics have more than once made to Huguenots. "My dear sir," said I, "were you ever baptized?" "I never was," replied the Quaker, "nor any of my brethren." "Zounds!" said I to him, "you are not Christians, then." "Friend," replies the old man in a soft tone of voice, "swear not; we are Christians, and endeavour to be good Christians, but we are not of opinion that the sprinkling water on a child's head makes him a Christian." "Heavens!" said I, shocked at his impiety, "you have then forgot that Christ was baptised by St. John." "Friend," replies the mild Quaker once again, "swear not; Christ indeed was baptised by John, by He himself never baptised anyone. We are the disciples of Christ, not of John." I pitied very much the sincerity of my worthy Quaker, and was absolutely for forcing him to get himself christened. "Were that all," replied he very gravely, "we would submit cheerfully to baptism, purely in compliance with thy weakness, for we don't condemn any person who uses it; but then we think that those who profess a religion of so holy, so spiritual a nature as that of Christ, ought to abstain to the utmost of their power from the Jewish ceremonies." "O unaccountable!" said I: "what! baptism a Jewish ceremony?" "Yes, my friend," says he, "so truly Jewish, that a great many Jews use the baptism of John to this day. Look into ancient authors, and thou wilt find that John only revived this practice; and that it had been used by the Hebrews, long before his time, in like manner as the Mahometans imitated the Ishmaelites in their pilgrimages to Mecca. Jesus indeed submitted to the baptism of John, as He had suffered Himself to be circumcised; but circumcision and the washing with water ought to be abolished by the baptism of Christ, that baptism of the Spirit, that ablution of the soul, which is the salvation of mankind. Thus the forerunner said, 'I indeed baptise you with water unto repentance; but He that cometh after me is mightier that I, whose shoes I am not worthy to bear: He shall baptise you with the Holy Ghost and with fire.' Likewise Paul, the great apostle of the Gentiles, writes as follows to the Corinthians, 'Christ sent me not to baptise, but to preach the Gospel;' and indeed Paul never baptised but two persons with water, and that very much against his inclinations. He circumcised his disciple Timothy, and the other disciples likewise all who were willing to submit to that carnal ordinance. "But art thou circumcised?" added he. "I have not the honour to be so," said I. "Well, friend," continued the Quaker, "thou art a Christian without being circumcised, and I am one without being baptised." Thus did this pious man make a wrong, but very specious application of four or five texts of Scripture which seemed to favour the tenets of his sect; but at the same time forgot very sincerely a hundred texts which made directly against them. I had more sense than to contest with him, since there is no possibility of convincing an enthusiast. A man should never pretend to inform a lover of his mistress' faults, no more than one who is at law of the badness of his cause; nor attempt to win over a fanatic by strength of reasoning. Accordingly I waived the subject. "Well", said I to him, "what sort of a communion have you?" "We have none like that thou hintest at among us," replied he. "How! no communion?" said I. "Only that spiritual one," replied he, "of hearts." He then began again to throw out his texts of Scripture; and preached a most eloquent sermon against that ordinance. He harangued in a tone as though he had been inspired, to prove that the sacraments were merely of human invention, and that the word "sacrament" was not once mentioned in the Gospel. "Excuse," said he, "my ignorance, for I have not employed a hundredth part of the arguments which might be brought to prove the truth of our religion, but these thou thyself mayest peruse in the Exposition of our Faith written by Robert Barclay. 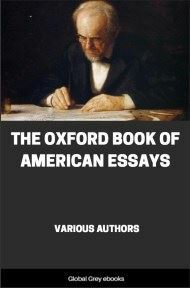 It is one of the best pieces that ever was penned by man; and as our adversaries confess it to be of dangerous tendency, the arguments in it must necessarily be very convincing." I promised to peruse this piece, and my Quaker imagined he had already made a convert of me. 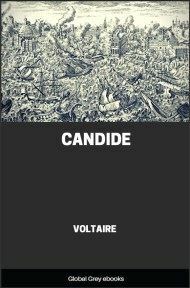 He afterwards gave me an account in few words of some singularities which make this sect the contempt of others. "Confess," said he, "that it was very difficult for thee to refrain from laughter, when I answered all thy civilities without uncovering my head, and at the same time said 'thee' and 'thou' to thee.